On the sideline of the World Economic Forum on ASEAN 2018 (September 11-13), in Vietnam, the Straits Times (Singapore) had an interview with Prime Minister of Vietnam Nguyen Xuan Phuc on policies in the 4th Industrial Revolution as well as assessment on trade war and free trade agreement. Question 1:What are some of the best examples that showcase Viet Nam’s entrepreneurship in its policy making? First, the Vietnamese Government has policies to cultivate the startup and innovation ecosystem and to promote the development of businesses, aiming for the target of having at least 1 million enterprises by 2020. The 2014 Investment Law has created a new investment policy framework, reflecting a new state administration mindset. Accordingly, investors are free to do business in all sectors and industries that are not prohibited. In addition, the Government picked 2016 as the year of the “start-up nation” and implemented the plan, “Supporting the national innovative start-up ecosystem until 2025”. These policies have created a vigorous wave of start-ups in Viet Nam, and in 2017 we broke the record in the number of newly established business as more than 127,000 new businesses came into being, 1.6 times as high as the figure in 2011. Second, the Government is focusing on improving the business climate and enhancing national competitiveness. Accordingly, we are actively reforming specialized inspections, trimming more than 50% of the number of existing business requirements. We have introduced the “single-window” mechanism in administrative processes, and are making level-four public service connectivity a requirement. Customs clearance is now entirely online and paperwork is no longer required. Inspection for customs clearance is now applied to only 10% of goods, down from 30% previously. I myself frequently meet and speak with businesses to encourage entrepreneurship and address hurdles in doing business. In addition, presently the Vietnamese Government is redoubling efforts in implementing e-government to better enable administrative reforms. Third, Viet Nam’s entrepreneurship is also reflected in our international integration strategy. The development reality in Viet Nam and other countries in the world have demonstrated that economic integration and connectivity is a driver for growth and employment. In spite of our status as a developing economy, Viet Nam has actively participated in next-generation free trade agreements, including the Comprehensive and Progressive Agreement for Trans-Pacific Partnership (CPTPP) and the EU – Viet Nam Free Trade Agreement (EVFTA), with the potential to foster entrepreneurship and improve the business climate in Viet Nam. These agreements carry commitments that shall promote entrepreneurship and improve the business environment in Viet Nam. Question 2: Amid fears of a worsening global trade war, what shall be Viet Nam’s stance on protectionism? What is your opinion about the level of free trade within ASEAN? 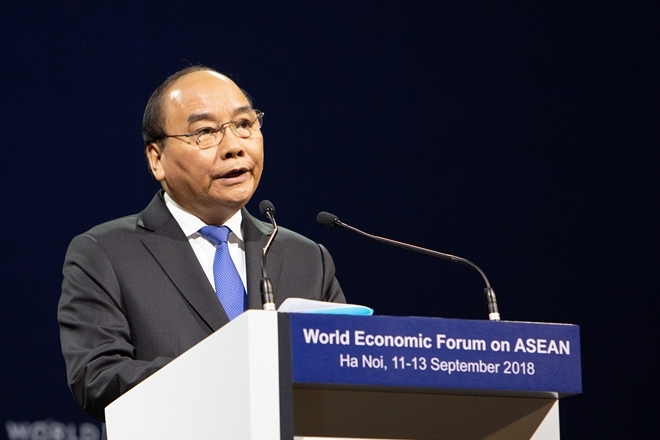 PM Nguyen Xuan Phuc: The reality of development in Viet Nam in particular and ASEAN in general has demonstrated that trade is an important driver for growth and employment. Protectionism is not the answer for the prosperity of nations. Since the beginning of our reform and open-door process in the late 1980s, it has been our consistent policy to engage in regional and global economic integration at the regional and global level alike. This has been clearly expressed through our accession to ASEAN, APEC, ASEM and WTO, and particularly our participation in Free Trade Agreements (FTAs), including next-generation and high-standard ones such as the CPTPP and EVFTA. Against the backdrop of mounting protectionism and trade friction, Viet Nam supports the promotion of a free, fair, transparent and rules-based multilateral trading system. ASEAN is a leading region in the world in terms of economic connectivity and is striving for greater intra-bloc liberalization as well as more extensive cooperation with external partners. Regarding intra-bloc cooperation, in terms of trade in goods, ASEAN is approaching the goal of removing tariff barriers according to the ASEAN Trade in Goods Agreement (ATIGA) with 98.67% of ASEAN’s tariffs to be removed in 2018. The liberalization of trade in services and investment within ASEAN is also meeting high standards, through the execution of commitment packages within the ASEAN Framework Agreement on Services (AFAS) and ASEAN Comprehensive Investment Agreement (ACIA). Regarding external cooperation, ASEAN has now become the connecting hub for leading partners in the Asia-Pacific through a network of Free Trade Agreements of 3 billion people and a total GDP of 20 trillion USD. The level of liberalization between ASEAN and these partners is expected to increase even further once the Regional Comprehensive Economic Partnership (RCEP) is signed. However, to foster the Community’s economic strength, ASEAN countries need to enhance intra-bloc integration, trade and investment while simultaneously expanding economic cooperation with partners and promote the role of ASEAN as an engine for regional economic connectivity. Question 3:In your view,what are the most pressing issues in ASEAN right now, for which innovative solutions are required? Why? PM Nguyen Xuan Phuc: “Innovation and resilience” is the theme of ASEAN 2018. In reality, “innovation” has always played an integral role in the creation and growth of the Association throughout the last half century. That very innovation has helped ASEAN overcome challenges, translate the Community into reality based on three people-centered pillars, and strive for common interests. More than ever, ASEAN should further foster the spirit of “innovation” to guarantee success in the current context. First of all, realizing the ASEAN Community is a process built upon consensus, solidarity and unity. In that light, ASEAN should continue to uphold this spirit in its activities as well as in its relationship with external partners. Secondly, ASEAN intra-bloc cooperation, particularly economic cooperation, requires new drivers at a higher level and with greater intensity, so as to harness the advantages of the 4th Industrial Revolution for a breakthrough. To achieve this goal, developmental balance and harmony among ASEAN economies should be the top priority in ASEAN cooperation today. For example, ASEAN intra-bloc trade turnover only accounts for less than 25% of the total trade volume of ASEAN. Therefore, accelerating integration within ASEAN requires great innovation; this is also the key to affirm the resilience of our region. As such, in the future, we need to devote more efforts in this regard. Last but not least, communication about the ASEAN Community should also be given special attention. Until now, awareness about the ASEAN Community of each citizen and enterprise remains modest. This presents a huge challenge for people to directly contribute to the Community-building process as well as to help them benefit from what the Community has to offer. ASEAN should seek new and more innovative measures for citizens to become fully aware of and harness the Community-element of ASEAN. Question 4: Vietnam has a high mobile penetration rate and its people are digitally savvy. How will the Government harness these strengths to grow the country’s digital economy? The Government shall establish an enabling environment, such as an ecosystem for the development of digital economy. This shall first of all be manifested in a legislative and policy environment as an expression of our consistent policy of openness and willingness to experiment with new business models on the basis of the Fourth Industrial Revolution's digital platform. We also seek to create a ripple effect in the use of information and digital technology, and step up economic restructuring and growth model transformation in close coordination with digital transformation. We shall focus effort in implementing e-government, with an aim towards digital government, digital economy and digital society, closely linked with institutional reforms and information technology application. We shall prioritize the comprehensive improvement of the legal framework and the superstructure for e-government; the establishment of the National Public Service Gateway, the National Census Database and other national databases; the promotion of online public service provision at the third and fourth level to meet the needs of the people and businesses, while paying due attention to ensuring information security and safety. Next in line is to develop a comprehensive system of information infrastructure, focusing on investing in and developing 4G and 5G networks; and encourage enterprises to invest in information infrastructure to ensure public access. In addition, we are developing the necessary human resource for the development of the digital economy, particular in the information technology sector, through promoting information technology literacy as part of universal education, with the aim to equip all citizens with digital skills. We shall also have policies to assist youths in startups, particularly those employing new ideas in digital technology. Lastly, promote the application of digital technology in all aspects of socio-economic life, particularly in such promising areas as agricultural management, manufacturing industry, logistics, digital finance, healthcare, etc. These efforts both help increase the productivity, quality of services and competitiveness in these areas, and create a vast market to encourage the development of the digital economy. This is itself an opportunity for Viet Nam to rise.